Nintendo’s Switch fighter is getting its first DLC brawler via Persona 5 this week. The Mementos stage will include cameos from many of the other Phantom Thieves, and the stage’s base color will change depending on the music being played. Joker’s Final Smash is a recreation of Persona 5’s all-out attacks. Version 3.0, which will also be released on April 17, was also detailed in Nintendo’s latest Smash Bros. Ultimate video. It will introduce new modes, including the previously leaked Stage Builder mode. Players can build in either handheld mode or via TV Mode, and there will be “new stage elements” for players to choose from. These stages have different layers to allow players to add decorative elements. Stages will be featured in a different tab on the Stage Select screen. Version 3.0 will also introduce a Video Editor mode. Players can import videos saved to their Nintendo Switch and edit on a timeline. Players will be able to share these videos and stages in a new Shared Content mode. Players can upload and download Mii Fighters and custom stages, upvote creations, and follow specific creators. Nintendo is also introducing Smash World for the Nintendo Switch Online app on smart devices. It will allow players to view stages and videos without starting up Smash Bros. Ultimate, searching by fighters or recommendations. You can queue stages to download from the app to have them ready to download the next time you play Smash Bros. In-game notifications can be checked here, while Spirits teams can also be created via the app. 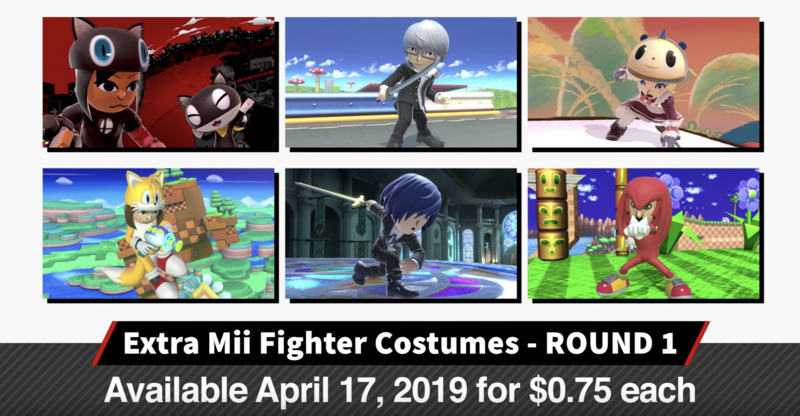 Nintendo will also release extra Mii Fighter costumes as paid DLC, including costumes based on Persona 5, Persona 4, Persona 3, and Sonic the Hedgehog. They will be available on April 17 and each cost $0.75.